Home Land Security (HLS) and safe city projects are underway in various courtiers around the globe. Surveillance project is typically based on a Video Management System (VMS) that includes installation of hundreds of various indoor/outdoor cameras at different locations covering the whole protected area, with analog or IP interface to a Network Video Recorder – (NVR) servers array. For complete site monitoring, a range of sensors and detectors can be used, with detailed Geographical Information System (GIS) site maps that can be zoomed into great details views. All types of sensors and cameras are represented as an overly symbolic layer on the site maps to enable fast event location identification and drag & drop of element’s icon to be displayed on the wall. A Situational Server performs automated event reporting and handling based on video analytics and other analysis tools with on-going system health monitoring. Surveillance Operations and Control Center is basically used for cameras video streams monitoring, event analysis and decision making. 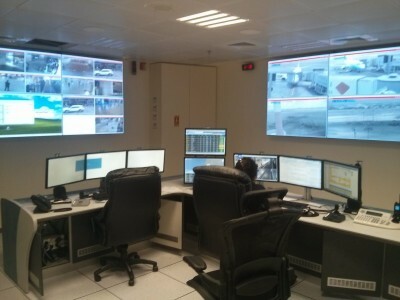 In order to enable the display of multiple relevant cameras concurrently, and a range of other situational systems such as GIS maps, sensors and detectors, a large video wall is used. In addition to military and boarder protection sites, Surveillance systems are being used in airports, mission critical facilities and other governments and municipalities applications. Any large site such as Airport or Safe City project is dynamic and has to be scalable in order to cater to the growth and expansion of that site and also to be upgradeable and versatile in order to incorporate new sensors and tie in different functions such as utilities. High performance and flexible video Wall processor is a key element for addressing the reliability and video quality needed for event analysis and decision marketing. NVU has gained a lot of experience in this domain by cooperation with leading surveillance vendors and building highly integrated solutions. NVU controllers offer a range of solutions starting at small sites all the way to large, multi systems operations. The system can interface directly to IP cameras or analog cameras attached to IP video encoder. 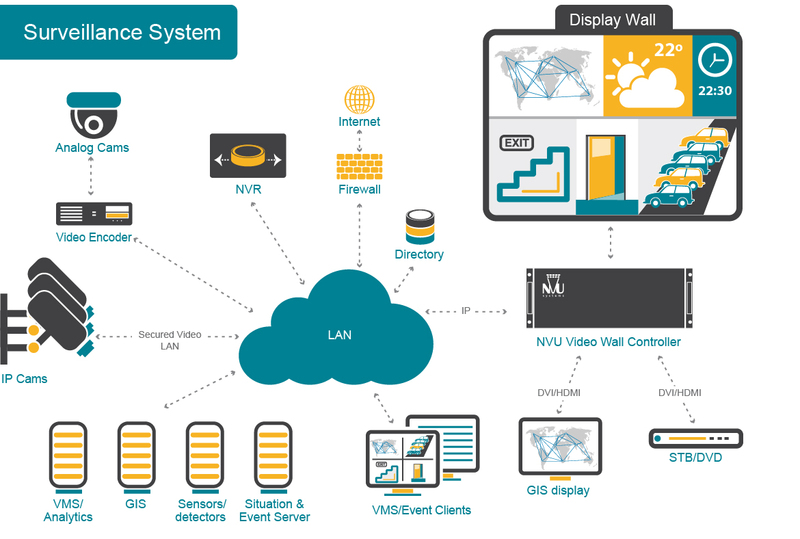 Alternatively, the Wall controller can receive all video streams from NVRs. The system provides an intuitive video viewing interface, source drag and drop operation and can be remotely controlled, through usage of the API, by operators at the VMS client workstations for fast presets changes.